The original Dragon Ball series, with as much of the filler removed as possible. For the purposes of this edit, "filler" refers to anything that wasn't in the original comics written by Akira Toriyama. Therefore, this edit attempts to follow the original comics as closely as possible. 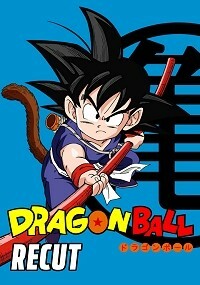 Like most Japanese cartoons based on shonen comics, Dragon Ball was being produced at the same time that the comic was being written. However, cartoons are produced at a much faster rate, and in order to prevent them from catching up to the comic, "filler" is frequently added to pad out the story. Filler can very in length from segments of an episode to multiple episode arcs, usually serving absolutely no purpose in furthering the main story, and can be a drag to sit through. Sometimes filler can even create plot holes if the author of the original comics later writes something that contradicts a filler event (which did, indeed, happen in this series a couple of times). The later Z portion of the Dragon Ball story recently had much of the filler removed in the form of Dragon Ball Z Kai where it's pacing was greatly improved. Sadly, the original Dragon Ball (aka almost the entire damn first half of the Dragon Ball story) was neglected. So, quite simply, my intention with this edit was to remove as much filler as I possibly could from the original Dragon Ball series. This greatly improves the pacing while, at the same time, eliminating any plot holes that were introduced as a result of filler. This also makes a great companion piece to Dragon Ball Z Kai. While I was able to remove footage from just about every episode, there are a few episodes that don't actually have any footage removed from them compared to their original Dragon Ball counterparts. Therefore, as per the rules of IFDB, I am unable to include them in this listing. So, in order to help you fill the gaps, here is a list of each missing episode of my edit along with it's original Dragon Ball counterpart. - Episode 1 (Dragon Ball episode 1) - Episode 3 (Dragon Ball episode 4) - Episode 7 (Dragon Ball episode 8) - Episode 18 (Dragon Ball episode 24) - Episode 19 (Dragon Ball episode 25) If you are watching this fanedit, you should OWN the source DVDs, so this won't be a problem. However, please keep in mind that I completely removed all next episode previews from my edit as they constantly referred to events in the next episode that I had removed. So, when you watch these missing episodes elsewhere, I would advise you to ignore the next episode previews. Kenisu and all of his great Dragon Ball BGM documentation. Episode lengths (and file sizes) vary, due to the nature of the editing process. I tried to keep the episodes around 24 minutes or so, but it was really a matter of finding a good ending point for each episode. For that reason, some episodes run for about 18 minutes while others can go for as long as 32 minutes. I tried not to go much longer than 30 minutes per episode, but sometimes it couldn't be helped. Priority was given to the original Japanese track. By that I mean that I edited around the Japanese track first, and then edited the English track accordingly. I did so for a couple of reasons, the first of which is that the Japanese track is in mono, making it very difficult to manipulate in any significant way, so whatever edits I made had to accommodate the Japanese track first and foremost . The second reason is that I personally don't much care for the English dub as Funimation didn't dub it very accurately. For that reason, there may be a line inconsistency or two found on the English track due to Funimation constantly changing the dialog entirely from what it originally was supposed to be (if they hadn't done that so frequently, it wouldn't have been an issue). - Disregarding the OP and ED themes, eyecatchers, title cards, and NEPs, that leaves each episode BEFORE EDITING at about 20 minutes and 26 seconds of actual show time. - Multiply that number by 153 episodes total, and you're left with 52 hours, 6 minutes and 18 seconds. - That leaves us with a grand total of 23 hours, 1 minute and 15 seconds worth of actual show footage cut, all of which was filler in one way or another. You'll notice that I still included the recaps in that estimate which also isn't completely fair, but the reason I did so is because some episodes towards the beginning didn't really have recaps, and I didn't always cut them anyway (it wasn't until sometime during the RRA arc that I finally decided to cut the recaps entirely). For those reasons, it would have been difficult for me to calculate. Even so, that added recap time would probably only result in about a 2 or 3 hour difference tops, which still leaves around 20 to 21 hours of filler cut.